A weekend hot air balloon festival in Florida featured more than just the magnificent sight of flame-powered flight when police reportedly discovered one balloon that had been stolen from nearly 900 miles away. The Marion County Sheriff&apos;s Office said in a Facebook post that the balloon, which is multicolored with a grid pattern, was found Saturday while deputies were checking balloons at The Villages Hot Air Balloon Festival being held at the Florida Horse Park. "You’re going to think we’re full of &apos;hot air&apos; when you read this, but for the first time in our 175 years of existence, we recovered a stolen hot air balloon!" the sheriff&apos;s office said. The sheriff&apos;s office said they received notice from the Bloomington Police Department that the balloon had been stolen out of their jurisdiction and was spotted at the festival. The owner of the balloon said he just wanted his property back and did not want to press charges, according to police. 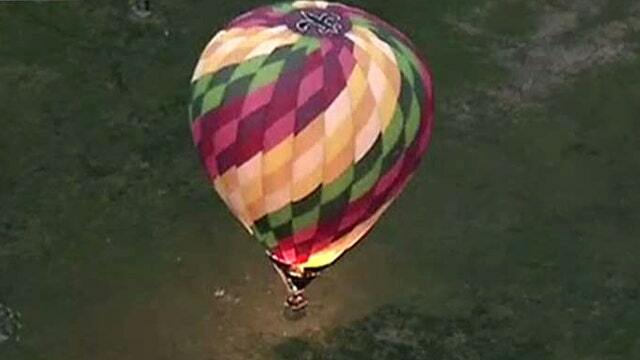 It&apos;s not clear if authorities determined who stole the balloon -- or why. The balloon was towed from the festival grounds so it can eventually be returned to its owner in Indiana. "This just proves that you never know what the MCSO is going to be called out to next," police said.